Along with "The Full Monty" and "Dirty Rotten Scoundrels," this is among the most satisfying transplants of a popular film comedy into a rousing stage musical. 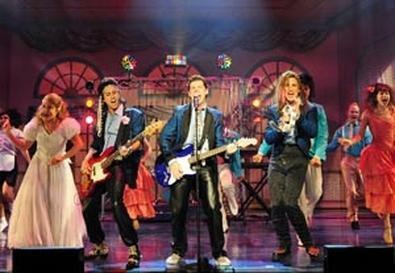 This effervescent 2006 adaptation of the 1998 film is set in 1985 New Jersey, rocking to the beat of that era. It deliciously spoofs its blue-collar milieu, recalling what "Hairspray" did for the rock 'n' roll heyday of 1960s Baltimore. Director Larry Raben's rendition is a swirling cavalcade of visual splendor, hilarity, spectacular song and dance, and nonstop energy. The production is blessed with David Lamoureux's sensational music direction and Spencer Liff's dazzling choreography. The triumphant designs impart style and crisp period atmosphere, particularly Jean-Yves Tessier's lighting, Cliff and Kat Senior's wigs, and the flashy uncredited sets. The book, by Chad Beguelin and Tim Herlihy, is largely faithful to Herlihy's memorable screenplay, and the flavorsome score by composer Matthew Sklar and lyricist Herlihy is a constant delight. A gradually evolving romance between titular crooner Robbie Hart (Ciarán McCarthy) and the sweetly vulnerable waitress Julia (Renée Brna) is forestalled by her betrothal to arrogant, womanizing executive Glen (delightfully despicable Derek Keeling). Robbie is callously deserted at the altar by self-centered fiancée Linda (the amusing Kelli Provart), expressing his despondency in the poignant yet hilarious "Somebody Kill Me." He receives comfort from his hip grandmother Rosie (the uproarious Mary Jo Catlett), who ends her encouraging "A Note From Grandma" with a reference to the "skanky whore" Linda. In roles strongly associated with Adam Sandler and Drew Barrymore from the film, the lead players offer captivatingly original takes on the characters. The irresistible McCarthy creates a hilarious mix of sad sack and resilient funnyman. He strums a mean guitar and belts out his songs with style, sass, and vocal dexterity. Brna is a charmer, boasting a wonderful singing voice and an endearing quality that helps anchor the broadly funny shenanigans with genuine heart. Among terrific supporting turns are Jenna Coker-Jones as Julia's zany Madonna-esque cousin Holly, Tracy Lore in multiple roles, and the performers playing Robbie's band mates: Nick Bernardi as goofy Sammy and Matthew J. Vargo as flamboyant George (as in Boy George wannabe). Presented by Musical Theatre West at the Carpenter Performing Arts Center, 6200 E. Atherton St., Long Beach. July 9–24. Thu.–Fri., 8 p.m.; Sat., 2 & 8 p.m.; Sun., 2 & 7 p.m. (562) 856-1999, ext. 4. www.musical.org.